Chop each shrimp into 3 pieces, reserving the meat from the tail end. Chop the tail meat very finely and set aside for garnish. Clean and chop the red pepper and half an onion. Not quite finely chopped, but you’ll want very small, uniform pieces. Sauté in a non-stick frying pan with a tbsp of olive oil, for just a few minutes. You want them to retain a little crunch. Remove from heat. Stir in 1 tbsp of Old El Paso™ Taco Seasoning, and 1/4 cup cream cheese. Add the chopped shrimp pieces (reserving the chopped tails) and 3/4 cup shredded cheddar cheese. Stir over low heat until the cheese is melted. Immediately before serving, spoon mixture into the tortilla scoops, top with the pico de gallo, a few shreds of cheese, a fresh cilantro leaf and a few sections of the finely chopped shrimp tail meat. This delish shrimp party app looks all fancy pants, but it's actually easy peasy. I’m on a bit of a streak lately, due to my extraordinarily conflicted nature. I love love love hearty, meaty or cheesy cocktail party appetizers …. But I hate how they look on my buffet table. Think about it …. The bread bowl with the artichoke dip looks rather dilapidated moments after it arrives at the table. 7-layer dip, don’t even get me started. Queso fundido? Not so fun. What IS fun is tiny, individual versions of these appetizers. Let’s start with another delicious but often visually offensive challenging offering … The nacho. I had these Shrimp Nacho Bites at a cousin’s house and still think about them often. And my cousin too, of course. I love them. Both of them. The nachos (speaking collectively, as there are definitely more than two in the nacho department), and the cousin. 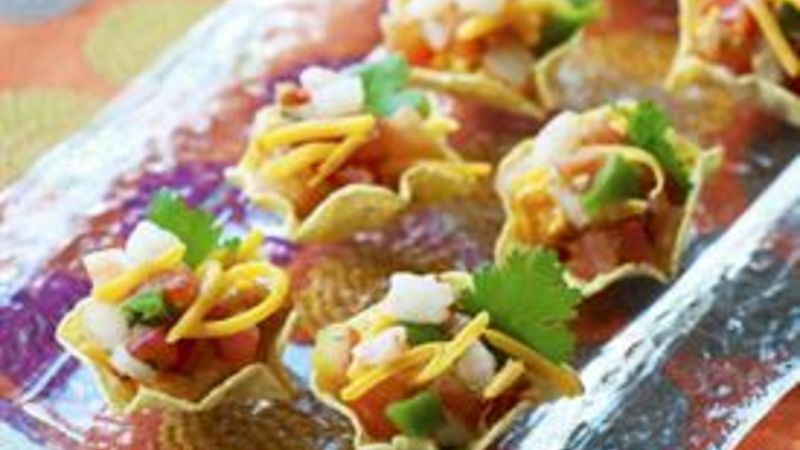 To make these individual nacho bites, start with 3/4 pound shrimp, fully cooked, tails off. I just buy the frozen shrimp, thaw, and take off the tails. They don’t need to be the giant fancy kind – the 3/4 pound bag I buy says 50 shrimp per bag. I often buy them on sale and keep a bunch in the freezer. Chop each shrimp into 3 pieces, reserving the meat from the tail end. Chop the tail meat very finely and set aside for garnish. Chop the red pepper and half an onion. Not quite finely chopped, but you’ll want very small, uniform pieces. Sauté in a non-stick frying pan with a tablespoon of olive oil, for just a few minutes. You want them to retain a little crunch. Remove from heat. Stir in 1 tablespoon of Old El Paso Taco Seasoning. Then add 1/4 cup cream cheese. Add the chopped shrimp pieces (reserving the chopped tail meat) and 3/4 cup shredded cheddar cheese. Stir over low heat until the cheese is melted. Immediately before serving, spoon into the tortilla scoops. A fresh cilantro leaf ... And a few sections of the finely chopped shrimp tail meat. I’m kind of a stickler on garnishing anything containing seafood with a little chunk of the actual seafood. Peanut allergies get a lot of play right now, but all food allergies are bad news. You may have guessed that we have seafood allergies in my family. My darling Aunt Tia has a particularly nasty reaction, and as such can distinguish a tiny piece of shellfish from a diced onion from 100 paces. You can imagine all the horrible “safety garnish optional” jokes we make during the holidays, but the truth is I don’t know how to use an epi-pen. A safety garnish is so much easier. Anyway, just an important safety tip hidden in some slightly questionable food allergy humor.